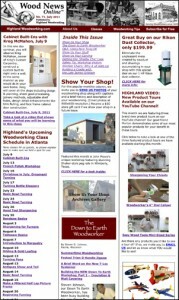 The July 2011 edition of Highland Woodworking’s Wood News Online is out and ready to read. This month we’ve got even more great woodworking deals, stories and tips than ever. In the July issue we are kicking off our new woodcarving column, Show Us Your Woodcarving. 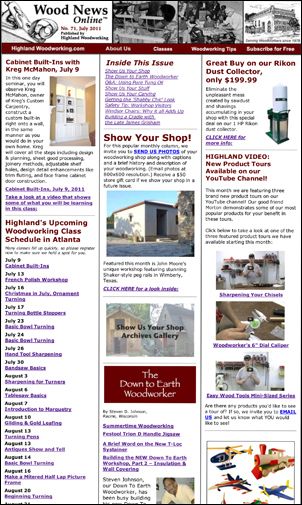 This column will have varying purposes every month – displaying your work, talking about woodcarving methods and techniques and getting tips from experienced woodcarvers. Check out the column and let us know what you would like to see! We’ve also got John Moore’s Wimberley, Texas workshop with its stunning shaker peg rail design, Gary Smith’s fascinating miniature chuck wagons in our Show Us Your Stuff column and a wonderful article from Charles Brock about helping preserve a woodworker’s legacy. Three new product tours on our Youtube channel with Morton, a new Down to Earth Woodworker column and a great article from Peter Galbert on what motivated him to focus on Windsor Chair design are also included, along with a whole lot of great deals! Go check it out and ENJOY! The Sander Sitter Orbital Landing Pad: Living Large in my Woodshop Woodworking Tool Video Tours: July features Sharpening Your Chisels, Woodworker’s 6″ Dial Caliper & Easy Wood Tools!